H&O Plastics has launched its hottest new product, bright red plastic fire buckets that are significantly cheaper than metal alternatives. Although fire-fighting technology has moved on quite a lot in the past couple of decades, fire buckets still have a place in certain environments. And this bright plastic container is a modern and cost-effective alternative for businesses across Britain. They are suitable for preventing or extinguishing small fires, especially flammable liquid fires. The heavy duty printed plastic containers are just as durable as their metal counterparts and will not dent or rust in outdoor conditions (think rainy garage forecourts and campsites). 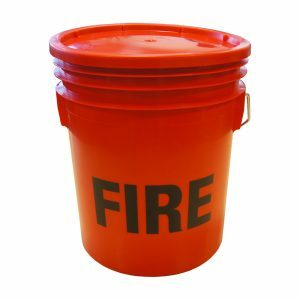 With a massive 16 litre volume and the word ‘FIRE’ writ boldly across the bucket face, these colourful buckets will not be missed in an emergency. Starting at £5.10 for one bucket, the containers are among the cheapest on the market. They are certainly the largest and sturdiest fire buckets that you will get at a similar cost price. Buying directly from the manufacturer means you get top quality products at rock bottom prices. There are also heavy discounts for vendors willing to purchase in higher quantities. Fire buckets have largely been replaced by modern fire extinguishers. But buckets are still a popular low-tech solution in some environments. In particular, they are still used on petrol forecourts where they are filled with sand that can be used to cover petrol spills. Sand can absorb flammable liquid making it less dangerous and reducing the risk of ignition and explosion. Fire buckets are routinely placed on special stands at petrol stations for staff and customers to use. Sand can also be used to extinguish fires and sand-filled fire buckets can often be found on campsites, in public and private corridors, and in cooking areas like next to outdoor barbeques.